Christmas is fast approaching and there is better way to prepare food than the usual lechon kawali, crispy pata or lechon. You can serve roast beef instead to impress your guest or your friends. Roast beef is not very expensive if you are going to cook it yourself and instead of filling the pockets of caterers when you plan to have a party this coming Christmas. 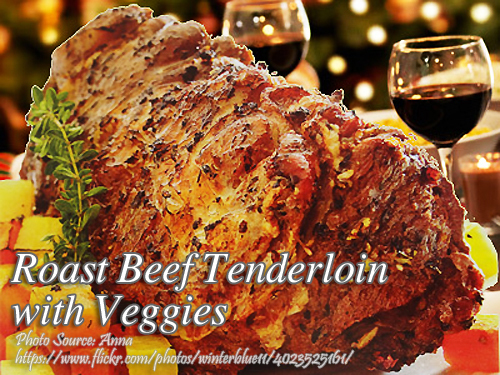 To cook roast beef tenderloin with veggies; Preheat the oven to 450 °F. Pat the roast dry. Mix the olive oil, thyme, garlic, salt, black pepper and dry mustard to make a paste. Rub the paste well and evenly on the meat. Lay the beef fat side up on a roasting rack set in a roasting pan. Place the roast in the preheated oven and roast for 10 minutes at 450 °F. When desired caramelization is reached, lower the oven temperature to 350 °F and continue cooking until internal temperature reaches 145 ° F for rare or until desired doneness. Then to prepare the vegetables, place the carrots, potatoes, salt, pepper and oil in a bowl. Toss to coat well. Transfer to a baking sheet and roast in the oven until browned and tender. When the roast is done, pull it out of the oven. Keep warm and rest for ten minutes. Carve the roast and serve it along with the vegetables. Pat the roast dry. Mix the olive oil, thyme, garlic, salt, black pepper and dry mustard to make a paste. Rub the paste well and evenly on the meat. Lay the beef fat side up on a roasting rack set in a roasting pan. Place the roast in the preheated oven and roast for 10 minutes at 450° F.
When desired caramelization is reached, lower the oven temperature to 350 ° F and continue cooking until internal temperature reaches 145 ° F for rare or until desired doneness. Then to prepare the vegetables, place the carrots, potatoes, salt, pepper and oil in a bowl. Toss to coat well. Transfer to a baking sheet and roast in the oven until browned and tender. When the roast is done, pull it out of the oven. Keep warm and rest for ten minutes. Carve the roast and serve it along with the vegetables.